The last time we went to the Toronto Zoo, Rose was maybe 4 months old and Emma was three. We had a good time, and Emma swears she remembers going. This time the girls were much older and actually able to walk most of the day. If you’re not familiar with my daughters, Emma is my eldest and she’s 7, and Rose just turned 5 earlier this month. They had been looking forward to this trip like crazy. 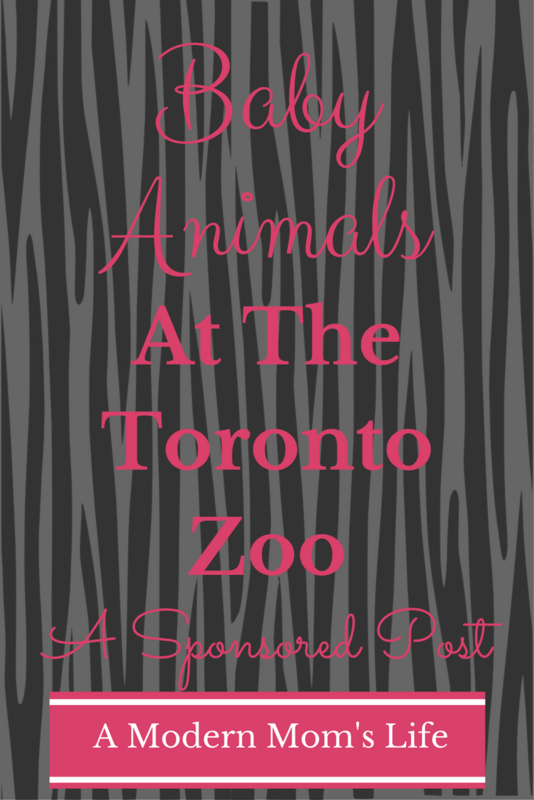 Did you know the Toronto Zoo is part of the amazing package that CityPASS offers for Toronto? If you are planning to visit more than one attraction in Toronto I would highly recommend checking out the CityPASS and all it has to offer! Of course we picked the hottest day so far this year to be outside at the zoo all day. This a trend with me and the zoo. I don’t go often, but when I do it’s so hot we’re all getting heat stroke. Luckily I’ve come to terms with the idea that we don’t really need to see all of the zoo in one trip. This visit’s focus was to see the baby animals before they aren’t babies anymore! First stop was the pandas! The baby pandas are now 7 months old and they are so cute! We were lucky to get into the zoo when it first opened. There was only a small line to get through at the panda exhibit. They have a ton of information about the pandas and the babies to look at while you’re waiting to see the pandas themselves. Unfortunately, because they are so popular, there’s a time limit to your visit with the pandas. It was still enough time to see them well and get some pictures. I’d suggest seeing them while they’re still in the cute little cub phase! Update March 2018: The pandas are now gone from the Toronto Zoo. 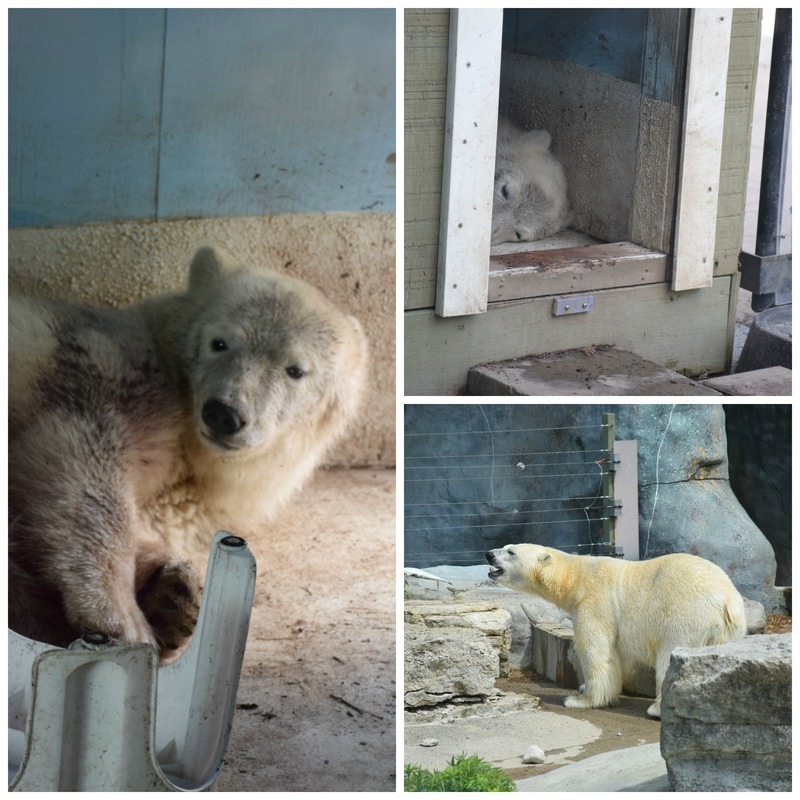 They have moved on the Calgary Zoo for further enjoyment and conservation efforts. We did manage to get through every loop or continent, with the exception of the Canadian Domain. That’s the one that’s down a giant hill. Every time we go to the zoo we go down then and the almost die coming back up on the hottest day ever. This time we just skipped it altogether. And I’m glad we did. The lions were the next babies we came across. They’re growing up quite quickly. They are older than the pandas but I’m not sure how much. They were also hard to see as they were lying up on the pride lands with their mother. 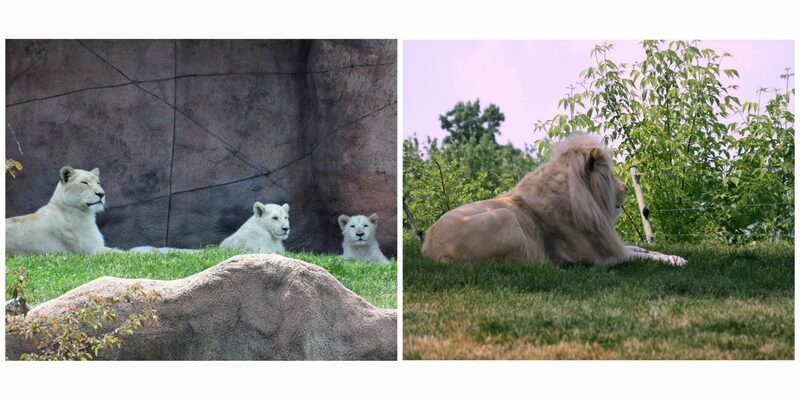 I didn’t realize this was a family of white lions – they are quite beautiful and the male has a mane, but it’s white! It just didn’t look right to me. Where’s Mufasa? The rhino baby was elusive. We stopped at the African Rhinos and had a really good look. There were 4 or 5 big guys but no baby rhino. I was pretty disappointed! So we looked at the gorillas (who were having feeding time – that’s always interesting to watch) and then headed into the Indo-Malaya section of the zoo. That is where the pavilion with the butterflies is and I love it in there. Except that there was no change in temperature from indoors to out so we actually sped through there a little faster than I usually like to. The rainforest style pavilions are great when it’s not exactly the same hot and sticky temperature in Canada at the same time. At the end of the Indo-Malaya loop there is another rhino exhibit. Guess what? The baby rhino is an Indian Rhino and not an African one! So we did find him after all. He was just laying with his mother in the exhibit. Not too exciting but we did get to see him. By this point we had been at the zoo for 6+ hours. We did sit in the A/C for lunch and that was about half an hour so that allowed us to refuel and lower our body temperatures enough to continue our day. To be honest I was impressed by the kids and their stamina on such a hot day. I was impressed with myself as well – there was a time I’d be overcome with heat stroke and throwing up in the shade after spending that much time being somewhat active on such a hot day. The baby animals have the right idea – stay inside or just lay around in the heat! So, moral of the story – baby animals are not babies forever. I figure you’ve got 3 or 4 months before the baby lions don’t look any different from the grown-up ones, and I don’t know how long the zoo is keeping the pandas for. If you want to see the babies or the pandas I think this summer you should plan a trip! If you show up when the zoo is just opening (9am) there are not great huge lineups – it only took us a few minutes to get through the gates. We really did have a great trip. I will be posting more pictures on Facebook and I will link through to my album here when it’s ready. If you’re interested in reading more of my reviews, visit my review page here. And if you would like me to review your business, event, attraction or anything else, check out my Work With Me page, or contact me for more information. Those baby pandas are soo cute. They are one animal I have yet to see in real life although I hope to one day. Aren’t they cute? We were so glad to have seen them when they were still small. But the big ones are super cute too! They sure are! My kids love visiting the animals – I love it for the conservation efforts! They sure are cute – and they had a huge lineup! But it was worth it for sure. I wish the zoo was closer so we could visit more often.